sleeps 7 in 3 bedrooms, open living, 2 showers, separate toilet. 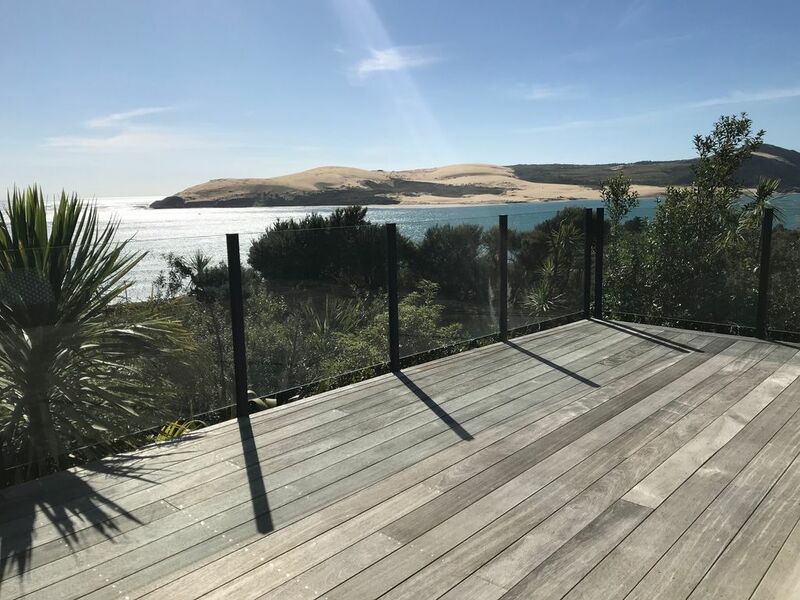 Enjoy a relaxed stay in our three bedroom modern beach house with stunning views over Hokianga Harbour. 5 minutes walk to the beach and 1km (walk or drive) from Opononi café, supermarket, bar and takeaway, this property is well positioned to maximise all that the Hokianga has to offer. Comfortable beds, with pillow and mattress covers, feather cushion, leather sofas, and extensive outdoor decks mean you can relax in superior comfort while enjoying the privacy of the garden and views of the harbour at the same time. Main bedroom has 1 Queen size bed, Second bedroom has a double bed, third bedroom has a single bed and bunk bed. There is a futon in the living area if an 8th bed is required. Extra pillows, duvet, blankets etc available at property. The laundry has a washing machine for hot or cold wash with a clothes line easy accessed off main deck. There is an outdoor shower (hot) as well as an indoor shower, vanity and a separate toilet. For your children - lots of games, DVD's, and space to explore. No television for a reason - there's too much to do and it's a place to relax and do other things. Swimming - 5 mins walk to the beaches and over 4 km of white sand beach. On the west coast beach at South point at certain tides you'll find natural spa pools. Hot pools - Drive 40 mins past Kaikohe to Ngawha Springs. Natural hot springs, truly natural ranging from 45 degrees to cold. Cycle Trails - 85km of cycle trail from Opua to Horeke, or break this up to very manageable 15 - 28km rides. Explore this picturesque trail which takes you through tunnels, forest, bush and board walk. Sandsurfing - Surf on boogie boards down the sand dunes. boogie board hire included with your ferry ticket. The ferry leaves from Opononi Wharf most days from 10am. Enquire at the Information Centre located next to the Landing Cafe in Opononi. Food and supplies - a reasonably priced local supermarket with a great range of product, including fresh meat, veg, fruit, wine and beer. Opo Takeaways comes highly recommended. The Landing Cafe is also a great spot for food and coffee. It becomes a highly recommended Thai Restaurant four nights a week. Copthorne Hotel - situated on the beach. Well worth sitting out on their deck to enjoy a cocktail on a summer evening. Walks - On the red book shelf at the house we have a book of 36 local walks. From a 10 minute walk around South Point, to a two day hike through forest and bush, the Hokianga offfers a range of options for walkers. We enjoy walking along the beach around to South Point, then up to the lookout. We are a family who enjoy travelling and sharing the privilege of owning a property in such a beautiful part of New Zealand. We built the property to accommodate two families and included everyone, including the children in the process to ensure they felt ownership of this special place. Marlin is the combination of our surnames. We chose this site because of the stunning views, opportunity to nestle the house into the bush setting and proximity to be able to walk everywhere. We designed it with an East and West facing deck so that you can always find a sheltered space regardless of wind, rain or sun and not lose the view. We deliberately do not have television or a a result we find our conversations, our eating and family time is quite different to those we have at home in the city. We hope you enjoy this difference as well. fully equipped kitchen, waffle maker, toastie maker, pots, platters, serving dishes etc. Watch a range of action, comedy, drama, kids movies on the screen provided. a range of magazines and books. we encourage our guests to take the books to enable us to keep the shelf fresh with new titles. Beautiful location and superb value for money. Really easy to find, great instructions and nice and clean. Highly recommend.